You can see from this timeline that it wasn’t terribly long ago that we stopped relying totally on hunting. For example, it was only 8,000 years ago that we domesticated the cow. Our ancestors could then have organic, grass-fed beef for dinner anytime they wanted! After World War II, American meat production became a big business. Free-range animals eating the food that nature intended for them became a thing of the past. Most cattle now spend their days in feed lots and are given hormones designed to get them fatter faster. The lucky ones are fed a diet of corn, or maybe soybeans. However, most mass-produced cattle and other farm animals are regularly fed diseased animals (sometimes of the same species), manure, and even plastic. They legally can be fed road kill, dead horses, and euthanized cats and dogs. This sick food leads to sick livestock, which is why antibiotics are needed to keep them alive until they make it to slaughter. There was a news item recently about a farmer feeding the cattle candy because corn had gotten too expensive! How nutritious do you think that beef will be for the humans that consume it? Even if you aren’t disturbed by the aesthetics (or morals) of this unappealing situation, you need to understand how this affects your health. I frequently write about the importance of omega-3 essential fatty acids in your diet. You may have wondered that, if they are so important, why and how could they possibly be missing from our diet? It doesn’t make sense! And here is the key. Meat from either wild game or from animals allowed to graze is lean, healthy, and full nutrients. Factory-bred animals that aren’t given access to their natural food supply no longer contain omega-3′s and neither does their meat. This was a huge “ah ha” moment when I learned this! This situation is not unique to beef. This same principle can be applied to pork, lamb, chicken, or the meat from any factory-raised animals we eat. These same problems trickle down into dairy and eggs. Even salmon, considered the best dietary source of omega-3 EFAs, won’t contain omega-3′s if they are farm-raised. This major change in our food supply in such a short time is responsible for a hidden epidemic of essential fatty acid deficiency. Harvard School of Public Health states that essential fatty acid deficiencies cause up to 96,000 preventable deaths per year and that 99% of the population is deficient. To make matter worse, when cattle eat mostly grain and soy, their meat becomes higher in omega-6 fatty acids. This is the bad kind that causes inflammation which we already get way too much of. Choose grass-fed and grass-finished beef, and pasture-raised pork and poultry if they are offered at your local stores. Buy grass-fed bison if you can find it. It’s a nice change from beef and lower in fat, calories and cholesterol. Buy meats, eggs, and dairy products from local farmers or at farmers markets when possible. Buy healthy meat online and have it shipped to you. If you’ve never tried bison, also called buffalo, you’re in for a treat. It tastes very similar to beef, but is grass-fed and leaner than beef. Bison is not that easy to find locally. I used to buy Trader Joe’s ground bison and frozen bison burgers, but they stopped carrying them. My favorite place to order bison online is from US Wellness Meats. They’ll ship directly to your door with the meat on dry ice. Each piece of antibiotic and hormone-free meat is individually vacuum-packaged and clearly labeled, and will last in your freezer for up to 2 years. Fun Fact: A cross between a bison and a cow is called a beefalo! Most Salmon Isn’t Really Wild. Or Pink. Real wild salmon is still a good source of omega-3′s. However, an expose by the New York Times and a leading consumer magazine revealed that much of the salmon sold as “wild” is actually farmed fish. 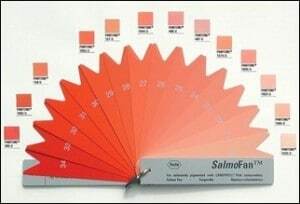 And you can’t judge the quality of salmon by its color. Stores choose from a variety of pink dyes manufactured by pharmaceutical giant Hoffman-La Roche. See the SalmoFan dye swatches on the right. Notice SalmoFan is trademarked. When we moved from Maryland to Arizona, as you might expect, the quality of seafood available took a nose dive. I bought so many bad pieces of fish, I’d all but given up buying seafood. That’s why I was ecstatic when my husband, a big seafood lover, found Vital Choice Wild Seafood & Organics. Their fresh-frozen wild Alaska salmon live their entire lives free to roam the open ocean. They carry such seafood delights as salmon burgers, smoked fish, and Alaskan king crab. They even have salmon jerky treats for your dog! Vital Choice has received endorsements from notable nutrition-oriented doctors such asAndrew Weil, Christiane Northrup, Nicholas Perricone, and Joseph Mercola. If you prefer a greater variety of meats, US Wellness Meats offers a fantastic selection of healthy, grass-fed meat. While they don’t offer lion, tiger, or bear, they supply just about everything else! You’ll find beef, lamb, poultry, pork, rabbit, and more. Here’s a quick look at the men and the cows behind US Wellness Meats. Learn what the grass-fed difference can mean for you. The human brain is designed to last a lifetime, but modern life takes a greater toll on the brain than most people realize. Deane teaches the best ways to keep your brain healthy and stay mentally sharp for life at her website BeBrainFit.com where you can learn how to make your brain sharp again.